Home » 1/48 Republic P-47D Thunderbolt "Bubbletop"
In May 1941, as the war raged in Europe, a single-engine fighter of more than 4t made its first flight. This fighter was the XP-47B, prototype of the Republic P-47 Thunderbolt of which a total of 15683 units will be built. Thanks to war experience, this aircraft was equipped with a 2000hp radial R-2800 engine, a supercharger and eight 12,7mm machine-guns. The XP-47B was to reach 633km/h and in January 1942, just after the USA went to war, the production of P-47B began. It was followed by the P-47C that incorporated various improvements and, from April 1943, by the P-47D, the most built version. The P-47D was equipped with an R-2800-59 engine, which can develop up to 2300hp with combat emergency water injection system engaged. The ducts that were passing on the sides and below the cockpit to connect the supercharger placed behind the pilot's seat gave to this plane its massive aspect. Many sub-types of the P-47D, designated D-1 to D-40, were produced but the first versions were called "Razorback" because of their sharp edge dorsal fin. The D-25 sub-type, which was introduced around June 1944, was fitted with an electrically actuated bubble canopy in order to improve pilot visibility and increased capacity fuel tanks. This decision resulted in a completely remodeled plane shape. All subsequent sub-types were also fitted with the bubble canopy and became a characteristic feature of late production Thunderbolts. The P-47 "Bubbletop" proved to be an excellent, well-balanced fighter-bomber. - Flaps come as separate parts and can be attached in the up or down position. 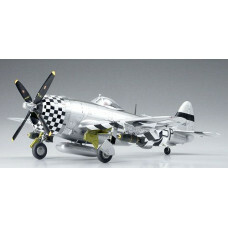 - Parts for replication of 3 types of mirrors, gun sights and 4 types of propellers are provided. - Engine cowling flaps and the intercooler air outlets on each side of the fuselage can be represented in the opened or closed position. - Parts for replication of 500-pound bombs, rocket launchers and 3 types of drop tanks are part of the kit. - A pilot figure and decals for two different markings are included.